January was a month of progress for Orion after struggling with a very bad ear infection that got him admitted at Children's hospital and those annoying rashes. It was as if he just took off once he recuperated from everything. Around January 5th, Orion put an arm through a shirt sleeve by himself. I first tapped his right hand, no response, so I helped him get started putting his hand through the sleeve. Then I tapped his left hand and he put his hand through the sleeve by himself. January 18, 2012: I attended a workshop, "Outcomes, Intervention Strategies and Teaching Caregivers", presented by Kat Stremel Thomas at The College of New Jersey, Ewing, NJ, near Trenton. It was so nice to get out by myself. Enjoyed driving and detouring/exploring like I could do freely when I was a Gallaudet recruiter "many years ago". Kat is researching deafblind children considering or have received cochlear implants. January 25, 2012: I introduced a toothbrush to Orion. We both "brushed" his teeth. When I had enough, I let him hold the brush. He continued to slowly brush his front teeth with that distinct motion. He stood/leaned on the couch during physical therapy at PIP for 1 minute 30 seconds! The exclamation mark is there because last time he stood it was for 14 seconds. Skyler spent a lot of time and several sheets of paper checking out the Brailler loaned to us from Prince George's County. Orion loves to explore holes he can get his fingers in. This wiffle ball was often checked out. February 1, 2012: Orion's Prince George's County Infants and Toddlers Program team came and visited him at Kendall's Parent-Infant Program class. One of Orion's teachers from Kendall PIP visited during a home visit by Prince George's County ITP back in December 2011. It was a wonderful experience to see everyone connecting, discussing and observing all because they care about Orion. I was pleased. Lucky little guy! February 4, 2012: Gma D's birthday. (Dorothea Nordstrand.) She would have been 96 today. My mom, uncles and family were at History House in Seattle to launch Gma's book of Green Lake girlhood memoirs, "Pork Neckbones, Sauerkraut & Rutabagas". Gma would have been very proud of her family. Orion finished off an entire NUK sippy cup of milk. It's still very much like a bottle with its soft top. We're trying to transition him to sippy cups. Orion stood upright for a few seconds as I held him centered, all weight on his feet. It happened just that one time. All the other times, he stood up/bowed over looking like a toddler Gamma (Γ). Orion has no problems putting his arms through shirtsleeves by himself, prompted or not. Before snip-snipping during his slumber. 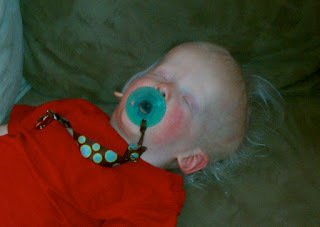 February 5, 2012 (Superbowl): Snip-snip went Orion's snowy hair as he was sleeping. He had long white hair on the top of his head that seem to sway like sea anemones when he's moved around. I saved clippings. His hair is so beautiful. Looks more like a toddler boy than a baby now. Orion, the next day after his haircut; Skyler is checking out the deer in our backyard. I continue to appreciate the little accomplishments. Yes, Orion is not as speedy in progress as our "typical kids" but each accomplishment is met with a "Yesss!" and/or a quarterback fist pump. This is Orion's pace: Little and Often! Seek the good in all situations if you can. For example, if your little emerging reader gets in trouble for writing a sentence with an obscene word; even though I'd frown at the word selection, I'd still ask, "Was the grammar correct?" Katra with her new kitty toys from her human grandparents. By early January, Orion was at the end of a long stretch of uncomfortable issues. The last of the annoying issues was nasty, burning diarrhea and we slathered on a lot of trusty Desitin hoping it would work wonders for his red parts. Looking back, it all started before Thanksgiving. He had a smelly right ear but was behaving fine and was prescribed antibiotics. The smell went down and did not disappear completely. Well into December, the stench came back even stronger the second time around. 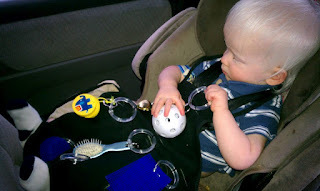 I did the usual take-baby-to-doctor-and-get-medicine routine. The weekend before Christmas, Orion screamed when we put on his activated CI processor/coil. We gave Orion and the equipment a time-out until he went to the ENT for follow-up Tuesday after the weekend. Skyler and Anastasia track Santa's Christmas Eve progress via NORAD's website. For his ear, he had to take 9cc's of bactrim orally two times a day. It was a struggle! He now dislikes applesauce and karo syrup because I tried and failed to conceal the taste of the medicine. He would open his mouth for other foods but became tight-lipped when he knew it was applesauce. The advice nurse gave me useless advice, to try to reason with him that he had to take the medicine. I was left with trying to force the syringe in his mouth and squirting some in. I took him to urgent care on Christmas Eve and Christmas Day asking for any other way. I even asked for a special IV line where it can be left in and I can bring him to the doctors for a dose. I tried new strategies to get 18 cc's in Orion in a 24 hour period (karo syrup, or 6cc's every 8 hours, or 3cc's every 4, etc.) By the time I think Orion's getting used to it, after around 10 days on bactrim late on New Year's Eve, he developed bright red cheeks. Orion's New Year's Eve festivities included sleeping. Oh, great! No fever. Then on New Year's Day, dotted rash showed up on his chest in the morning. By night it was all over his body. I took our little frequent flyer to urgent care again on January 2nd. It was either post-viral rash or allergic reaction to the sulfa in the medicine he had to take so the doctor told us not to continue the medicine. Orion happened to shriek and make his usual cute little noises... Yes, Orion, now's a good time to celebrate, you don't have to deal with the antibiotic anymore! On January 3rd, we saw his CI surgeon at Johns Hopkins and eventually the audiologist to tweak his processor volume to the point where he can wear it without crying. He had to get used to it all over again, the wearing of a contraption on his head. It looks like the crying during the first week of January was because he hadn't worn it continuously since around December 17th when his screaming started even though he'd been wearing it regularly at that time. I'm guessing his ear infection was so bad his ear hurt. It turns out the last of his issues was a yeast rash. Nystatin was prescribed and his bottom improved quickly. Bactrim can cause overgrowth of some bacteria... thus the yeast issue. We don't know if the infection was caused by his CI's presence. He did have a brief cold right before his infection was obvious. Orion has to wear a swimming ear plug in the bath because of the tube in his right ear. His ears smell just fine. Thank goodness!